Yet another stylish and professional product by Salonwear is the zipper smock. This product is expertly designed to highlight your client’s natural beauty. Our plus size hairstylist zip smocks are made from the highest quality fabric, ensuring that your client enjoys a hassle-free salon session. If you’re looking for the most relaxing and durable line of zipper smocks, look no further! Here, at Salonwear, we ensure that our clients receive top-quality products with innovative designs. These zip front smocks can also be used as hairstylist smocks also. Salonwear’s zipper smock is a durable and chic product, designed to provide coverage from any spillage. The design of the zip front smock allows your client to feel at ease while enjoying the services that your salon offers. The salon hair stylist smocks plus size not only provide the right kind of coverage but also look very graceful. The smock features zipper shoulders for the whole body protection. Other offerings at salonwear include caftan robe, super salon lab coats for women, barber jackets, big shirt, super jacket, and many more salon smocks. 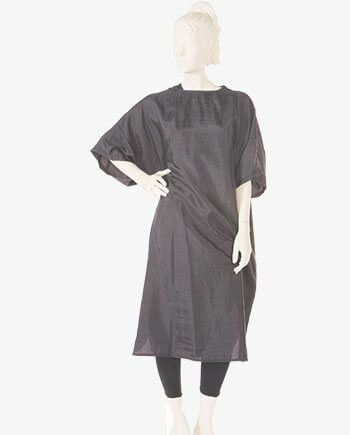 The cosmetology zip smocks are made from silkara iridescent fabric. This fabric ensures that your client’s clothes are safe from chemicals and stains. Salonwear’s zipper smock for men are lightweight and easy to wear. This ensures that your clients are comfortable while wearing this grooming smocks for long hours. The zipper smocks have an ideal length for your clients. Wide sleeves are added to these smocks to safeguard your clients’ arms from any spillage. The zip smock is currently available in a classic black color. Apart from the several spa and salon accessories and apparel, Salonwear also helps to improve your brand awareness. We present you with the option of customizing the apparel and accessories using your spa or salon’s logo. This creates a feeling of solidarity and trust among the members of your team. With these custom zipper smocks, you can create a unique brand identity. We use screen printing and embroidery techniques to personalize your spa and salon wear. Our embroidered custom barber smocks and personalized hair stylist smocks are sure to get your customers impressed! Why Choose Salonwear’s Zip Smock? Salonwear has been a highly recognized name in the salon and spa apparel industry in the United State of America for over 31 years. Our experience in the market has allowed us to offer top quality products designed with modern trends to fulfill our clients’ dynamic needs. We treat our clients as part of our Salonwear family. Our aim is to constantly increase customer satisfaction and ensure that our clients are happy and content. With our top quality service, the Salonwear family is continuously expanding. We offer you products directly from the factory, thus reducing the costs dramatically. This has given us an edge over our competitors and ensured that we stay at the top.